I've been the luck recipent of some great gifts the past few days. 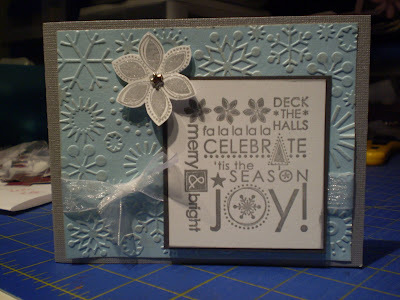 Cindy gave me the great Stampin Up set. 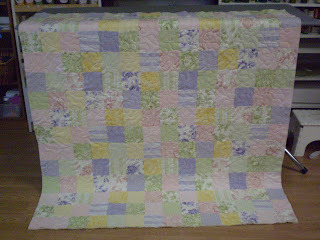 Mom gave me the fabric for Hamels Mystery Quilt club for 2009 and the pattern is a thank you from my friend Deana for quilting her quilt. Thanx ladies! LINE 8-inch square pan with foil, with ends of foil extending over sides of pan. Beat margarine and peanut butter with electric mixer until blended. Add wafer crumbs; mix well. Gradually add sugar, mixing well after each addition. Press onto bottom of prepared pan. MICROWAVE frozen whipped topping and chocolate in microwaveable bowl on HIGH 1 min. ; stir. Microwave an additional 15 to 30 sec. or until chocolate is melted and mixture is blended; stir. 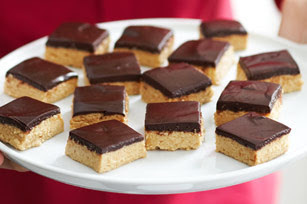 Pour over peanut butter layer; spread to evenly cover peanut butter layer. REFRIGERATE at least 2 hours. Use foil handles to lift dessert from pan before cutting to serve. We were all spoiled and I hope you were too! 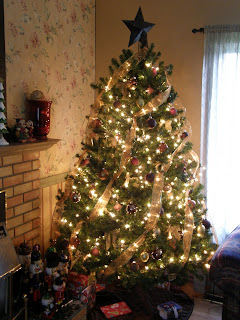 Couldn't have asked for a better Christmas; our first one home in two years. 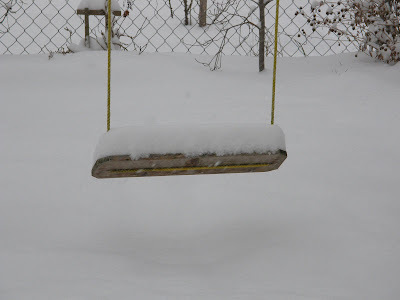 With all the snow, the only thing that would have made today better was if my brother and sister in law could have made it out. 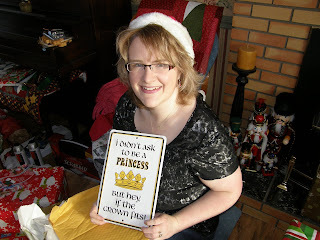 I have to say, I LOVE my new sign! And it really is true lol! finished this just in time! This is for my dining room table. 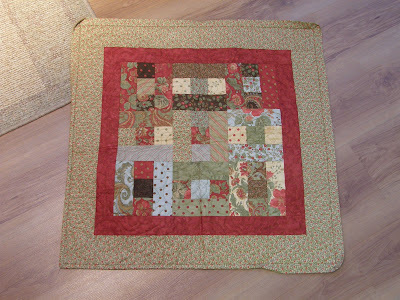 Fabric is a Cranberry Wishes by Moda jelly roll. 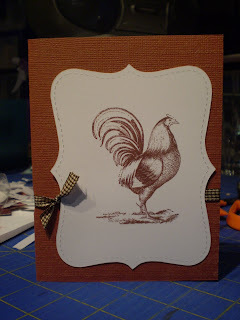 Hamels doesn't have this line but I was able to match the colors to Kansas Trouble's line, Autumn Journey(they designed the Cranberry Wishes line) and get some borders. 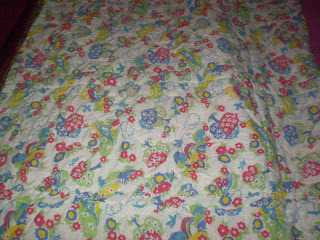 It was supposed to be 70inches squared but I made it smaller, 63inches lol. 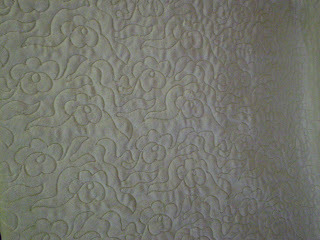 Quilted with Holly and Poinsettia Now to get the binding done! 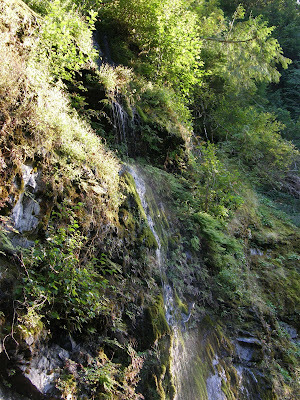 Yes, 2007. 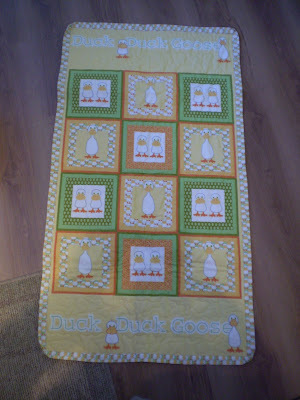 Mom made me this table runner but it wasn't quilted. Yesterday she finally got it completed. Thanx Mom! 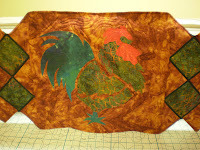 And check out the gorgeous batik backing, more roosters! 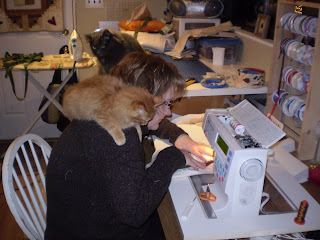 That I had sewn enough yesterday and that it was time to go to bed. 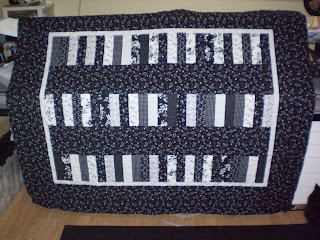 And I accomplished sooooo much yesterday; the borders on my quilt(and now I'm heading off to work to quilt it and mom's Christmas present), got B's pillow made and all 3 of my little wallhangings. 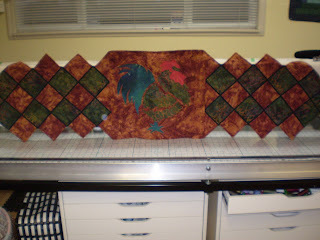 Now I just need to do the applique on the tea towels and I may even get my last embroidery project finished. Woo hoo! 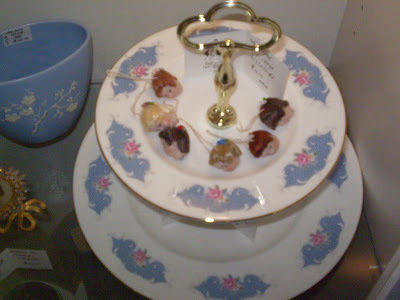 This is a Moda charm pack; I think it's Victorian Holiday?? Anyways, I don't like it. Just doesn't seem festive to me. 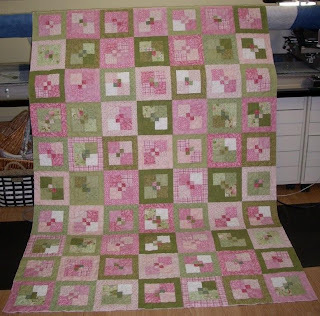 Plus I'm not following a pattern, I just didn't want to work on any of the half finished Christmas gifts that I should be working on lol! 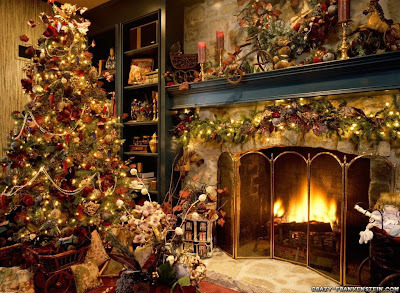 How is everyone doing with their Christmas plans? 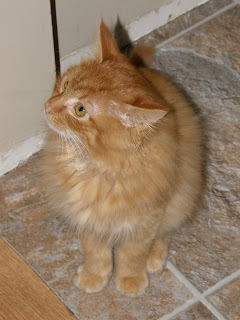 I have two more gifts for Jim to pick up tomorrow and a few goodies to bake. 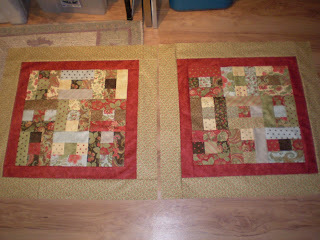 A wall hanging to quilt, a pillow to cover, 2 teeny tiny wallhangings to start(they are cut out out lol!!) 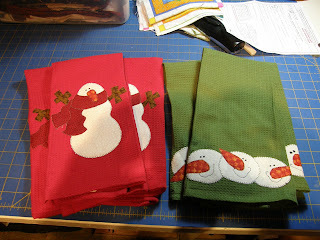 and 6 tea towels to applique. 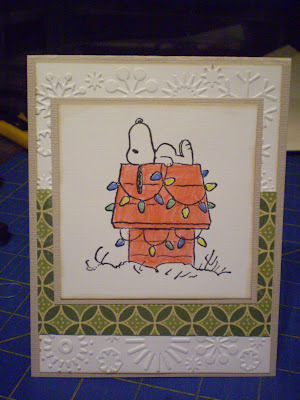 At least my Christmas cards were all mailed on time lol!! PREHEAT oven to 350°F. Lightly grease and flour two 9-inch round cake pans; set aside. Prepare cake batter as directed on package. Tint batter with food colouring. Pour evenly into prepared pans. Bake as directed on package. Cool in pans 10 min. ; remove to wire racks. Cool completely. BEAT cream cheese and icing sugar in small bowl with electric mixer on medium speed until well blended. Add whipped topping; stir until well blended. Spread evenly onto tops and sides of cakes. 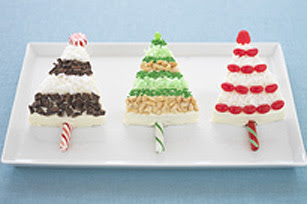 CUT each cake into eight wedges to resemble Christmas trees. Insert peppermint stick into bottom of each cake for the tree trunk. 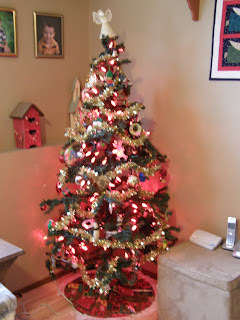 Decorate trees with remaining ingredients. Store in refrigerator. Could it be? Yes it is! 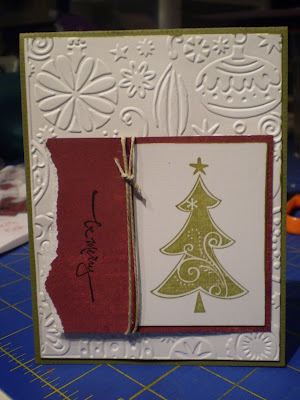 A Christmas card! My parents are keeping the boys tonight and Jim and I are taking off. 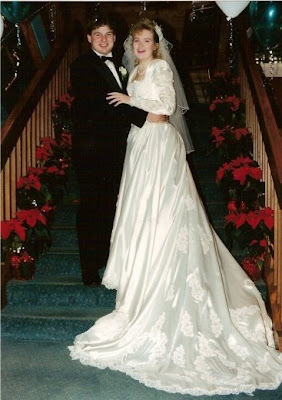 Looking forward to spending some time together and Christmas shopping-woo hoo! I am so happy. 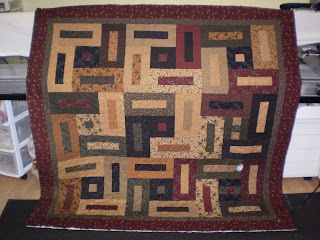 Friday was our due date for all our customer quilts. And guess what? We finished them ALL on time and most were even early! Woo hoo! 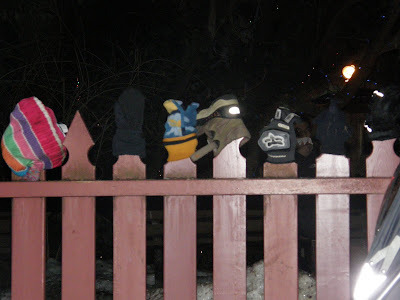 Since Christmas is just around the corner(9 more sleeps!) 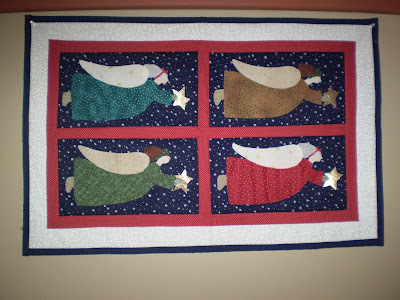 and get my quilted Christmas gifts finished. 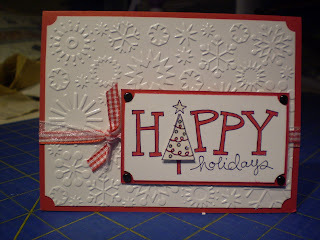 And yes, I did finish all my Christmas cards on the weekend and mailed them yesterday! These two were made using the leftovers from Mom's Christmas present. I'll take these to work tomorrow and get them finished off and get finishing some more! From Cindy. 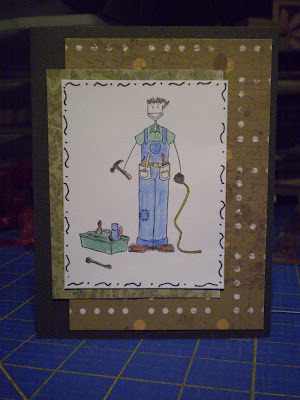 This is one of my favorite Cuttlebug folders. Thanx Cindy! 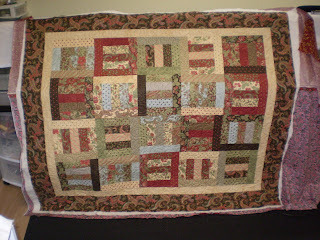 Over at Design Mom's blog Hurry over and enter! HEAT oven to 325°F. Line 13x9-inch pan with foil, with ends of foil extending over sides. Mix graham crumbs, 1/2 cup nuts and margarine; press onto bottom of pan. Refrigerate until ready to use. BEAT cream cheese and sugar in large bowl with mixer until blended. Add sour cream, flour and vanilla; mix well. Add eggs, 1 at a time, mixing on low speed after each just until blended. Pour over crust. BAKE 45 min. or until centre is almost set. Cool completely. Refrigerate 4 hours. Use foil handles to lift cheesecake from pan. 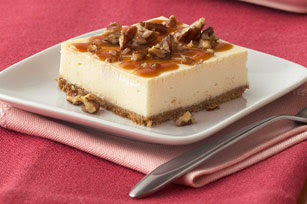 Drizzle with caramel topping; sprinkle with remaining nuts. 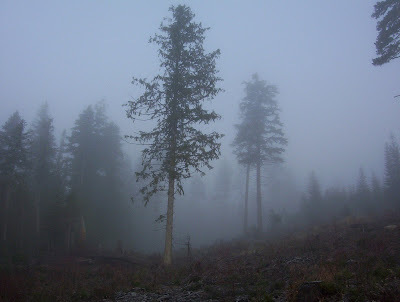 Let stand until topping is firm. 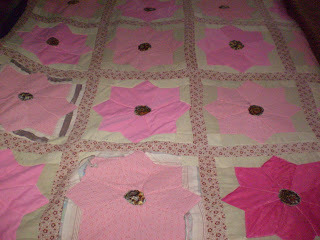 Two more customer quilts finished and two more to go before I am done for Christmas! 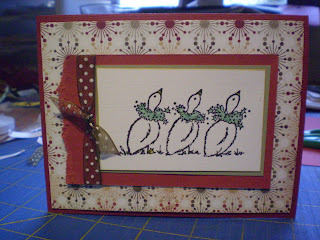 But I did and LOOK!, I made a Christmas card! Only 40 or so left to go now lol! 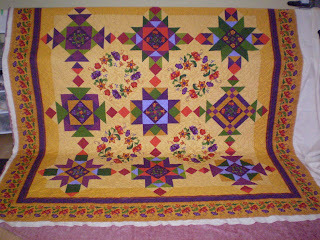 A special quilt monday for today. 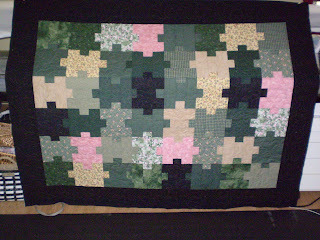 This quilt was made for me in 1983 by my grandmother. 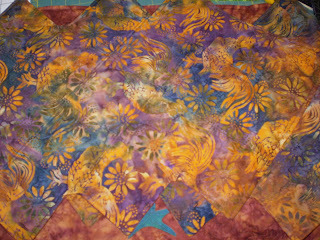 The top is pieced using leftovers from clothes she had made, most being polyester. 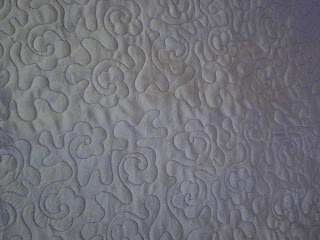 I love the back of this quilt. 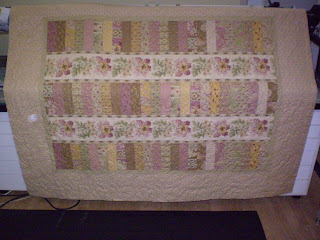 Grandma had machine quilted it herself. PREHEAT oven to 350°F. Grease and flour 2 (9-inch) round cake pans. Line bottoms of pans with wax paper; set aside. Combine cake mix and cocoa in large bowl. Add eggs, prepared coffee, water and bananas; beat with electric mixer on low speed 30 sec. Beat on medium speed 2 min., stopping frequently to scrape bottom and side of bowl. Pour evenly into prepared pans. BAKE 30 to 35 min. or until toothpick inserted in centres comes out clean. Cool 10 min. 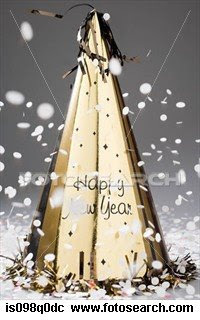 ; remove cake layers from pans to wire racks. Immediately remove wax paper. Cool completely. ADD coffee granules to milk; stir until coffee is dissolved. Set aside. Beat cream cheese in medium bowl with electric mixer on medium speed until creamy. Add coffee mixture; beat 2 min. Blend in melted chocolate. Add powdered sugar; beat until light and fluffy. PLACE 1 of the cake layers on serving plate; spread with 1 cup of the icing. Cover with the remaining cake layer. Frost top and side of cake with remaining icing. 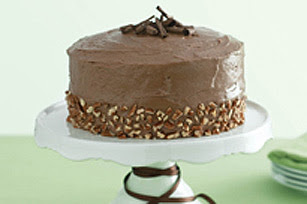 Immediately press pecans into icing on side of cake. Garnish top with chocolate curls, if desired. And I am exhausted! 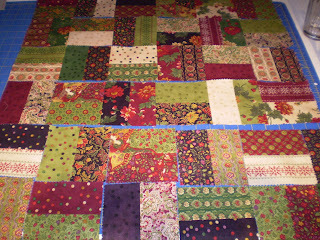 But we only have 7 more quilts to complete before next Friday. 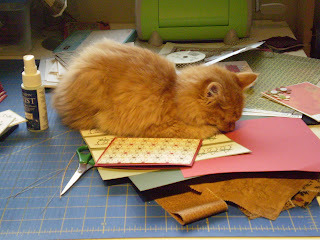 Maybe I can do my Christmas cards than lol! Again lol. It seems I've done this pattern more than any other this year. Good thing it is one of my favorites! I've been the lucky reciepent of some great gifts. 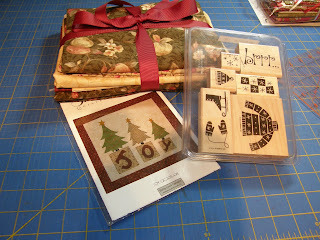 Cindy gave me this great Stampin Up set, Mom got me the fabric. 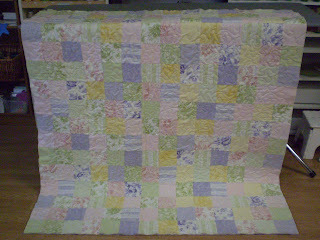 It is part of Hamels Mystery Quilt for 2009 and than my friend Deana gave me the pattern as a thank you for quilting her quilt. Thanx ladies!